We adopt the paradigm of understanding how the heart develops during pregnancy as a first principal to inform on adult heart repair and regeneration. Our primary focus is on developmental lineages which respond during cardiovascular injury and specifically on cells derived from the outer epithelial layer of the heart, the epicardium; the endothelial cells that make up the cardiac lymphatic vasculature and tissue-resident macrophages. 1. The epicardium and epicardium-derived cells (EPDCs) line the outside of the forming heart and contribute vascular endothelial and smooth muscle cells to the coronary vasculature, interstitial fibroblasts and cardiomyocytes. The epicardium can also act as a source of signals to condition the growth of the underlying embryonic heart muscle. In the adult heart, whilst the epicardium is retained it is effectively quiescent. The application of epicardial cell biology to treatment of cardiovascular injury originates from the epicardium’s developmental plasticity and from the ability to reactivate these properties in the adult heart. The embryology underlying EPDCs sets them apart from other adult cardiac stem cell populations and provides the rational underpinning prospective pharmacological and genetic manipulations aimed at mobilizing and guiding these cells towards regenerating the injured adult heart. • To identify novel inducers and signaling pathways which might be extrapolated to human EPDCs and facilitate drug discovery. 2. The cardiac lymphatic vessels have a heterogeneous cellular origin, whereby formation of at least part of the cardiac lymphatic network is independent of sprouting from veins. Multiple cre-lox based lineage tracing and genetic targeting of Prox1 has revealed a potential contribution from the hemogenic endothelium during development. This suggests lineage heterogeneity which may impact on the developing lymphatics and their response to injury. In the adult heart, myocardial infarction (MI) promotes a significant lymphangiogenic response, which can augmented by treatment with VEGF-C resulting in improved cardiac function. • To determine the effects of increased lymphatic vessel density on tissue fluid clearance, oedema and inflammation. 3. Tissue-resident macrophages, derived from sources of embryonic progenitors (including those of the yolk sac), populate the developing heart and have been implicated in remodelling the developing coronary plexus. Whether embryonic-derived macrophages play other roles in heart development remains unknown as does their precise contribution to the immune response and tissue repair during adult cardiovascular injury. Calcium handling precedes cardiac differentiation to initiate the first heartbeat. Characterisation of the human embryonic and foetal epicardium during heart development. Cardiac lymphatics are heterogeneous in origin and respond to injury. Dynamic haematopoietic cell contribution to the developing and adult epicardium. Re-activated adult epicardial progenitor cells are a heterogeneous population molecularly distinct from their embryonic counterparts. Thymosin β4-sulfoxide attenuates inflammatory cell infiltration and promotes cardiac wound healing. Epistatic rescue of Nkx2.5 adult cardiac conduction disease phenotypes by prospero-related homeobox protein 1 and HDAC3. De novo cardiomyocytes from within the activated adult heart after injury. Find out more about the Riley Group's public engagement. We are always keen to recruit talented DPhil students and as such are part of three specific schemes here in Oxford which can host/process graduate applications on our behalf. We welcome applications from talented potential postdoctoral researchers. 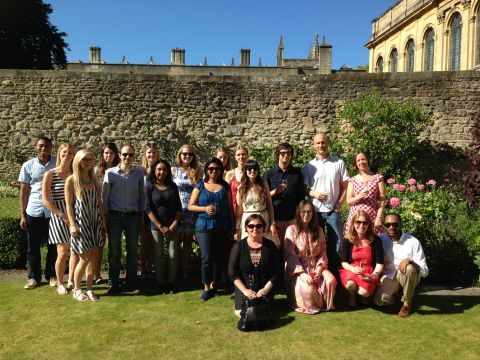 Vacancies are advertised on the Oxford University and DPAG Vacancies web pages, or we encourage potential applicants to secure fellowship funding, for which we have provided some example schemes.